Sorry I diappeared for a few days-the Christmas crazies got the best of me! This year after we decorated the kit houses, we had little gingerbread house cakes for the kids to decorate and then eat. It was a hit and the big house didn't get picked clean of the candy on the way home. 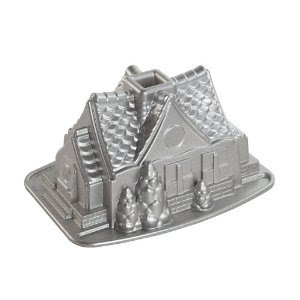 I bought this sweet cake pan at Target, but don't see them on the webiste. It's similar to this one-except it has 2 smaller cakes instead of 1 large one. Anna wasn't feeling well last night so I got to make my own cake. Love how sweet these are! Very cute houses! That is a super fun pan, I will be on the lookout for it! !